If you squint closely you can make out me on the right in the top picture. 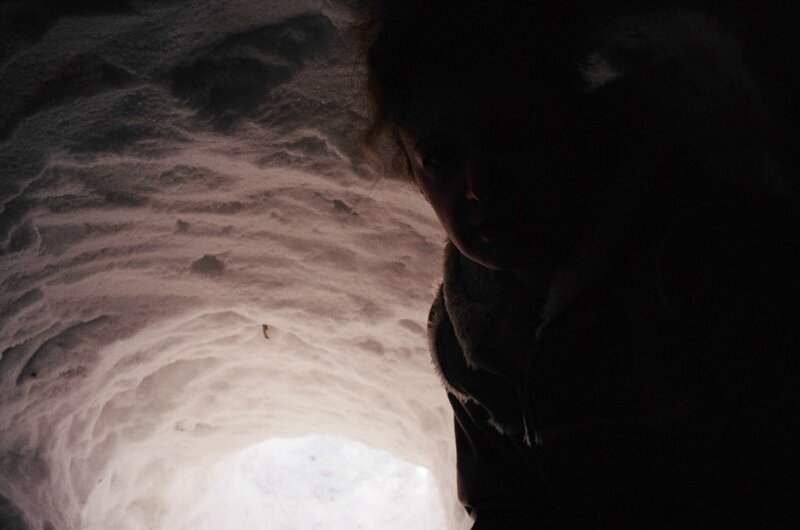 These two pictures are the view from inside the quinzee. …of Brenda Schmidt’s post I’m feeling nostalgic and saddened to know that this year at colony there may be no opportunity to build a quinzee. Every year Dave Carpenter oversees the building of one by those colonists who wish to partake–and usually everyone does their bit, ferreting snow like lost weasels, but I don’t think Dave is joining us this year at the colony. Last year I remember the weather was unseasonably warm, but that didn’t stop us from building a big pile of snow. I shovelled one afternoon, fighting an ice-cube of creative energy, and fighting with the orange tabby cat who kept throwing herself in the snow at my feet. The cat, if I remember correctly, or at least what my memory of the event allows me to remember, I shovelled up with the snow before tossing it onto the ever increasing pile. The cat seemed to like it. I don’t have any pictures of the outside on disc or on the computer, but I have these few from the inside. 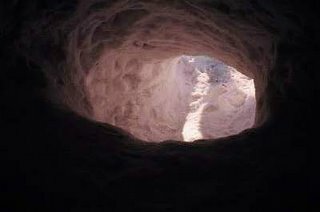 I must make one confession though, I’m the claustro-ferret, so actually going into the abyss was liberating, until everyone else wanted in–then I left. And for the record–or for anyone reading this within the next 24 hours or so–I never saw the word of the day (it says hermitage) until after I posted–this is an after post-edit-post. (Do-do-do-do-do-do-do (that’s the theme music from some old show that gives you goosebumps, or at least it’s supposed to)). Yes, sad that Dave and Honor won’t be there to rally the troops. And, there’s probably not enough snow, either, not unless Muenster’s had more than us. I’m rather fond of them too (more so because I actually went in).